This manga was created from multiple artists and authors. Out of all of the five chapters I have read I have only found 3 to be extremely pleasant and satisfying. I won't tell which, but they are psychological and beautifully created. IF you love to read short pieces of manga that reflect on emotions or on self-satisfaction. Other than the 3, the other pieces are average or mediocre and a waste of time to read. I would've given this a 10 if the other two stories weren't there, but we can't. This manga has intelligence, humour, and beauty! It shows exactly what humankind is doing with the world: destroying it. Maybe our generation won&acute;t see it, but this day will certainly come if we keep this behavior. The story is about this days, when the destruction or Earth is inevitable some people departs to another planet and, at the same time, builds a &quot;hotel&quot;, a tower controled by a super-computer with DNA from all beings , except the man. Its mission is wait to Earth becames liveable again to restore all the plants and animals, the manga shows the records of this computer through the years. The story is told in a very &quot;realistic&quot; way, beautiful art, hopefully it will make us think about what we are doing to our own house. This is a scintillating tale that will put more emphasis on the time that we share with our loved ones. A Present once opened, the inclement struggle of life shall pass. Story-There's nothing especially grandeur or ground breaking about this story. A student falls madly in love with her teacher, their is a reluctance in dating his pupil.Fast foward to Hanako being in chronic coma liked state due to an incurable disease , takao sucumbs to these difficulties as times. These stories at times try to be sensationalistic and unrealistic in trying to enthrall the reader but the story tries to be computational to real life. The propriety elicited from this manga showcases the strength of the human heart and mind that combats the turbulent events that can happen in life. This story entails the struggles that one must go through when witnessing their loved ones suffer. This story also displays how tradegy is an ordinary and common outcome in life which Takaos father is able to empathize with his son. A coalescing of emotions become resurgent within his father remembering the life that his wife took from him will waiting at her bed side. Contrarian to that he also felt helpless watching her suffer and the continuity of her suffering with no consolation. Due to the recuperative powers of some of the treatments her consciousness is restored but her personality is still dormant. Hanako will never be the same as her lack of what makes her uniquely herself which makes Takao feel that the world is filled with perfidy. Hanako senses Takao's innerdisorder residing inside of him, even though she can't express herself freely she still has some remote cognition.She gave him the present that Takao's father's wife failed to endow and that was the present of severring their bond. The gails and naked winds of suffering finally ended with a Present, as a gesture from a loved one telling him in a way to move on. Art-As a relatively new manga,the colouring and usage of variations fit well with the mood of the story.Everything congealed well together, with the art being continuous in its consistency. Character-Some might say that you need an archive or volumes of pages in order to sequester development. In this particular case that would be wrong with Hanako seeming to be a regular day girl at first and then becoming a resolute woman through sufferance. Takao fit the bill of being a concerned and trepidious spouse for his wife and the enduring pain in which he rationalized to keep on going. Their was an innumerable amounts of conflict that prompted development,which would otherwise be maladjusted and weak characters because of the length of the story. Takao's father also remonstrated within himself through the same conflicts, as readers we got a taste of how different people deal with the similar circumstances. Enjoyment-Heavily enjoyed but saddened when reading a piece that is based upon such a sacred and personal subject. Overall- If your a fervent supporter of a tear jerker type then I recommend this. However if your conducive to being too emotional then you might be turned off. If you believe in integrity or in the dutiful power that it takes in order to steer the ship out of the storm, I imagine this as your type of manga. I stumbled onto this manga when I was looking for a good one-shot to spend my time on. The apocalyptic premise of the story appealed to me immediately, and the cover looked promising as well, with the skyscrapers half submerged into the glittering ocean. Furthermore, hotel was the highest rated one-shot on this site and so I decided it would be a good investment of my time. I still think it was, but I'm not sure I would rate it as highly as the others who read it. The poignancy of the story is marred by a rather bizarre and hilariously bad attempt at making Keira Knightley (yes) a main character. She's married to a Japanese professor in the manga and doodles all over the hotel's supercomputer. It's admittedly a little funny but the oddity of the starlet's appearance and the inconsistency of the slapstick humor with the backdrop of a doomed world leaves a bad taste in my mouth. Once past all that though, the story gets significantly better. I really enjoyed the recounting of the supercomputer's attempts to stabilize its environment and protect the last DNA storehouse on earth. It's a beautiful variation on the Noah's ark theme and the mangaka does a good job at illustrating all the difficulties the AI had. 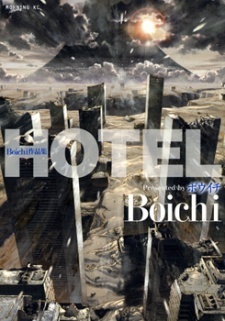 My only other complaint is that there seems to be a certain patronizing symbolism towards the end of hotel. It's not quite racist per se and it's likely the artist meant no harm, but it's still something that may bother people who catch the implications. Overall, I did enjoy the one-shot a lot though. I just think it would have been better if the author had stuck to a more serious beginning.